This entry was posted in Delhi, Dilli Darshan and tagged chirag dilli, contemporary delhi, delhi, delhi history, dilli darshan, jahanpanah, mosques, urban villages. Bookmark the permalink. 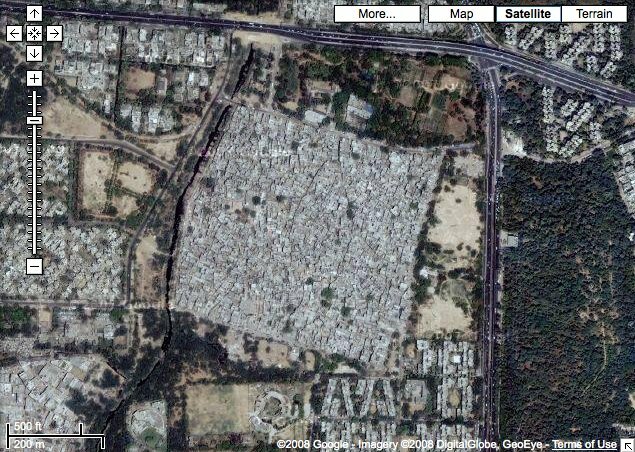 yeh aerial shots kya lagaye hai… though the conforming to the square is interesting.. hmm.. is that the sufi tomb there, at the left of the center of the square? looks very beautiful… from up here. That’s why I put them up – because they are interesting! Yes I think the patch of trees to the left of the square’s center is where the tomb complex is located.